We’d love your help. Let us know what’s wrong with this preview of Nowhere Else I Want to Be by Carol D. Marsh. Carol D. Marsh founded, directed, and lived at Miriam s House, a Washington, DC, residence for homeless women living with AIDS. In this powerful memoir, Marsh recalls how she came to confront issues far removed from her own experience: addiction, poverty, and the institutional racism that permeates our society on every level. From the humorous to the tragic, the mundane to Carol D. Marsh founded, directed, and lived at Miriam s House, a Washington, DC, residence for homeless women living with AIDS. In this powerful memoir, Marsh recalls how she came to confront issues far removed from her own experience: addiction, poverty, and the institutional racism that permeates our society on every level. From the humorous to the tragic, the mundane to the sublime, Marsh offers a gripping view into a world where the stakes are high and love is pushed to its limit. To ask other readers questions about Nowhere Else I Want to Be, please sign up. I'm looking fw to reading this. When does it go public? I wrote this book for three reasons: because I wanted to tell my story, because I didn't want to forget the women of Miriam's House, and because I wanted the world to fall in love with them as I did. If you liked this book, if you too want the world to know about these women, please help me promote it. Chronic migraines keep me from making the kind of book tour that authors and publishers typically plan. So, in addition to my online efforts, I rely on word of mouth for promotion. 1. Please post I wrote this book for three reasons: because I wanted to tell my story, because I didn't want to forget the women of Miriam's House, and because I wanted the world to fall in love with them as I did. 1. Please post about "Nowhere Else I Want to Be" on social media - facebook, twitter, pinterest, etc. 2. Please write reviews here on Goodreads, on Amazon, and on your blog. 3. Recommend the book to your local library and independent book stores. 4. Recommend the book to social workers, nurses, people with AIDS, nonprofit management and staff, anyone interested in social justice. 5. Recommend the book to college professors and departments of social work and health care. 6. Recommend "Nowhere Else I Want to Be" to people who are in service to others: gap-year volunteers, health care workers, counselors, therapists, serving overseas or in different cultures than their own. Seeing a homeless person on the street makes most of us feel compassion, or even guilt. We feel that it isn't right that anyone should have to live like this in a wealthy country such as the United States. Something needs to be done, we think. Someone should take action, we think. This is the true story of a person who not only saw this problem, but spent her life caring for these forgotten people in Washington D.C. Carol D. Marsh founded Miriam's House, a place where AIDS sufferers, including t Seeing a homeless person on the street makes most of us feel compassion, or even guilt. We feel that it isn't right that anyone should have to live like this in a wealthy country such as the United States. Something needs to be done, we think. Someone should take action, we think. This is the true story of a person who not only saw this problem, but spent her life caring for these forgotten people in Washington D.C. Carol D. Marsh founded Miriam's House, a place where AIDS sufferers, including those with additional problems such as physical or emotional impairments would find a place to take them in and care for them. In the early years of the AIDS epidemic, this disease was usually a death sentence, and an excruciating way to die. Miriam's House functioned as a Hospice center for these women. Later, as drugs were developed that made the disease more manageable, more women survived and Miriam's House helped launch some of them into a second chance at life. Others were lost when they reentered their old life of addiction and life on the streets. In this memoir, Carol D. Marsh tells the story of how she came to found Miriam's House, a place where women suffering from AIDS and related problems would find a caring home. She lived there with her husband for fourteen years, from 1996 to 2009 and found herself gradually transformed by the relationships she developed with these people whose lives differed so greatly from hers. Her upbringing as a middle class, white suburban girl was a world away from the world that these women came from. Most of them were African American and faced the additional problems of addiction, physical impairments or mental illness. Most of them had been living on the street. As she discovers how limited her understanding of these women is, Carol D. Marsh is forced to see aspects of herself that her privileged life had blinded her to. These tough women who had been stripped down to the essentials challenged her to see herself and others in a different way. This is not the story of a martyr, but of an ordinary woman who found fulfillment and happiness serving people who desperately needed someone to care for them. It is the story of these women and how they helped each other struggle with their demons, creating the only safe home many of them had ever known. Carol D. Marsh invites readers to enter a realm they probably can't even imagine and meet people unlike any they have known. She demonstrates how powerful the vision of one person can be. Through determination and hard work, she overcame multiple obstacles, and found personal fulfillment caring for these forgotten ones. Carol D. Marsh’s memoir explores the very complex and tumultuous experience of one woman as she embarks on a journey of servitude towards tending to the tender physical and emotional wounds of ailing women suffering from debilitating diseases. The common thread which links the women Marsh describes, quite affectionately I might add, is their HIV and AIDS diagnosis in addition to their unfortunate economic circumstances. Marsh’s narrative is both sincere and even comical on occasion as she shares with readers the tumult which ensues upon her sacrificial undertaking of managing and overseeing a residential home for homeless women suffering with the AIDS virus. Having come from a comfortable background lacking diversity and exposure to the common social ills felt by the women under her care, Marsh struggles to achieve common ground and earn their trust and favor as many of them often sneer and criticize her for her lack of cultural empathy and relatability. Those misunderstandings, however, eventually give way to a softening of hearts as the women, Marsh included, begin to realize the feminine and human bonds which unite them in spite of their respective circumstances. Things like beauty standards, the need for love and acceptance, and the desire to be understood are all common struggles which surpasses cultural divides and allows for the development and evolution of beautiful relationships and endearing life lessons. One of the great things about books is getting to live through experiences completely removed from your own. This was a random library pick up, and it was certainly something very different. The author started and lived in/worked in a house/program in DC for homeless women with AIDS for 14 years. This is an account of that time. It is mostly a collection of stories about various residents, with a little bit of the author's journey in learning to deal with things. (Idealism met reality, and it wa One of the great things about books is getting to live through experiences completely removed from your own. This was a random library pick up, and it was certainly something very different. I made it to page 250/325. I read this book for class and once I wrote my response to it and we discussed it in class, I couldn't be bothered to actually finish it. It wasn't bad, I'm just not really into memoirs so I'm not super interested in investing more time into it. This is a look inside a homeless shelter in Washington DC as well as the inside the woman's heart and mind who ran it. It delicately explores issues such as empathy, solidarity and privilege and is as timeless and it is relevant. Thank You to Inkshares for providing me with an advanced copy of Carol D. Marsh's memoir, Nowhere Else I Want to Be, in exchange for an honest review. PLOT- In the mid 90's Carol Marsh founded Miriam's House, a shelter in Washington D.C. for homeless women infected with HIV. Marsh spent many years as the director of the non-profit, including living in Miriam's House with her husband, Tim. Nowhere Else I Want to Be, is not just Marsh's story, but the story of the women who both worked and lived at Thank You to Inkshares for providing me with an advanced copy of Carol D. Marsh's memoir, Nowhere Else I Want to Be, in exchange for an honest review. PLOT- In the mid 90's Carol Marsh founded Miriam's House, a shelter in Washington D.C. for homeless women infected with HIV. Marsh spent many years as the director of the non-profit, including living in Miriam's House with her husband, Tim. Nowhere Else I Want to Be, is not just Marsh's story, but the story of the women who both worked and lived at Miriam's House. LIKE- I saw Nowhere Else I Want to Be on NetGalley and requested it for personal reasons. This summer, I moved to Portland, Oregon and we have an apartment in the middle of downtown, where we are confronted with extreme homelessness and drug addiction every time we step outside of our building. Quite honestly, it's a difficult thing to see, and I'm not dealing with it well, basically sheltering myself within our building. I had hoped that Marsh's memoir, might give me a better sense of the difficulties that people are facing, and that the personal stories, might make me less fearful and more compassionate. On this personal level, I think Marsh's book succeeded. It's the personal stories that make Nowhere Else I Want to Be, so compelling and tragic. One of the saddest stories is of a young woman, if I'm remembering correctly she is the youngest Miriam's House resident, who had contracted HIV from a blood transfusion as a child living in Africa. Although her family had to stay in Africa, she was sent to America for medical care. Her mother desperately tries to save money for visits, but knows that her daughter is dying in America, alone. The residents and employees of Miriam's House try to give her daughter comfort, but she is severely depressed and lonely. It's crushing. One of the strict rules for residents at Miriam's House is no drugs or alcohol. Zero tolerance, so that the women trying to maintain their sobriety won't be tempted by another's slip-up. Many of the women relapse, several times, making their stays at Miriam's House sporadic. Some die from overdoses and some simply disappear. However, more of the stories are hopeful, even if they ultimately end with death. These women get to die with care, knowing friendship and love towards the end of their lives. They have times where they can laugh and smile, knowing a sense of comfort that they likely would not have experienced without the non-profit. Another hopeful element of the story, is as Marsh's time working at Miriam's House comes to an end, new drugs and a better understanding of the virus, are extending lives and the women are learning to manage their disease, rather than rapidly declining. Miriam's House is no longer a place where women go to die. The part of Marsh's experience, that I didn't anticipate, but found so interesting, is her missteps and miscommunications as a white middle-class woman, working with primary poor women of color. Beyond the residents of Miriam's House, Marsh makes an effort to hire African American women, which sometimes creates a cultural difference between Marsh and her fellow employees. Although, over time, this lessens, as Marsh and her staff, learn to listen to each other and work with their various communication styles. Early on, it is pointed out to Marsh, that she has a great need to be "liked" and that she needs to let go of her need to better serve the women in her care. The transformation of Marsh is as compelling as the stories of the Miriam's House residents. Carol Marsh was the founder and director of Miriam's House, a residence for homeless women, the vast majority African-American, living with AIDS. This book deals with the difficulties Carol faced with starting this non-profit and the challenges of dealing with staff and residents that come from different backgrounds than her own. I found this book fascinating for several reasons. I enjoyed reading about how Carol had to overcome some of the normal difficulties with running a non-profit and how s Carol Marsh was the founder and director of Miriam's House, a residence for homeless women, the vast majority African-American, living with AIDS. This book deals with the difficulties Carol faced with starting this non-profit and the challenges of dealing with staff and residents that come from different backgrounds than her own. I found this book fascinating for several reasons. I enjoyed reading about how Carol had to overcome some of the normal difficulties with running a non-profit and how she realized that her race and how she was brought up affected her interactions with staff and residents. She isn't afraid to point out her weaknesses as a director and shows a real desire to become a better leader. The stories of the residents are the real heart and soul of the book. Some will make you laugh, and some will make you cry. By the end of the book, you can tell that the staff and residents make up a family, a bit dysfunctional at times, but a family nonetheless. Nowhere Else I Want to Be: A Memoir by Carol D. Marsh is a free NetGalley ebook that I read in late December. 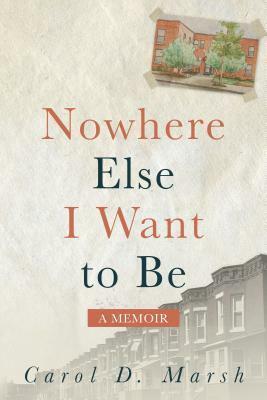 Nowhere Else I Want to Be covers the fourteen years that Marsh has spent founding and living at Miriam's House after a childhood and adulthood impassioned by social justice and public service. The nature of this book speaks of a nurturing household environment filled with outings and the comforts of home for homeless/disadvantaged women living with the effects of HIV and AIDS; where Marsh Nowhere Else I Want to Be: A Memoir by Carol D. Marsh is a free NetGalley ebook that I read in late December. An honest and vulnerable memoir about a time in DC's history when AIDS was a death sentence. Carol Marsh pours her heart and soul onto the pages. A great book for young people who want to "do good" in the world to consider how complicated that desire can be. Luckily, Carol is honest about her own failings and complicated humanity and it makes for an enlightening read. This is a deeply powerful memoir that inspired me toward activism. No one should have the life story that the woman described in these pages have experienced. Marsh does an amazing job of giving a voice to these women whose stories exemplify much of what is wrong with America today. Our current leaders would be well served to read this book and I plan to send it to my representatives. "Nowhere Else I Want to Be" is one of those great books you fall into, getting to know the people who inhabit it as dear friends. It's a non-fiction memoir that reads like the best fiction and brings you all the joy and heartache that a good book does. RECENT NEWS (June 2017): Carol D. Marsh's memoir, "Nowhere Else I Want to Be" has been awarded Finalist in two contests: 2017 Indie Excellence Awards and 2017 Next Generation Indie Book Awards. Carol D. Marsh lives in Washington, DC, where she is (as of January 2017) working on her next writing project, looking for ways to promote her memoir "Nowhere Else I Want to Be" and improving her online scho RECENT NEWS (June 2017): Carol D. Marsh's memoir, "Nowhere Else I Want to Be" has been awarded Finalist in two contests: 2017 Indie Excellence Awards and 2017 Next Generation Indie Book Awards.